Enter the Check Us Out Sweepstakes to Win Great Prizes! NBC29 is giving away nearly $60,000 in prizes between January 30, 2019, and February 27, 2019. The grand prize is a brand new 2019 VW Jetta 1.4T R-Line® from Flow Volkswagen! It's easy to play! Watch NBC29 News broadcasts between January 30, 2019, and February 27, 2019 for winners to be announced. If your name is drawn, you then have 29 minutes to call 434-220-2990 to claim your prize. See contest rules for complete details.See contest rules for complete details. 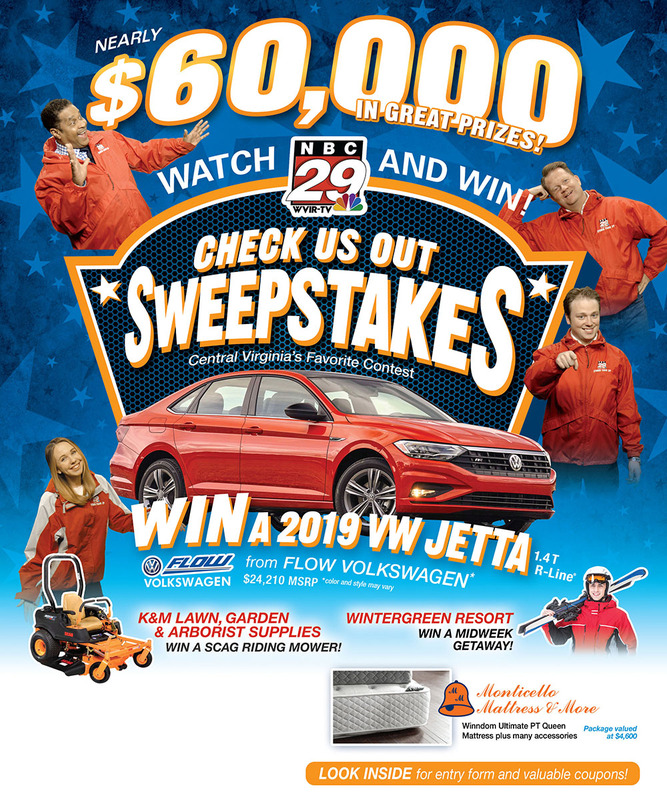 125,000 copies of the NBC29 Check Us Out Sweepstakes contest brochure have been mailed out randomly to homes in Central Virginia and the Shenandoah Valley. Copies are also available at prize sponsor locations (while supplies last) and on this website. Click, print and save with the Check Us Out Sweepstakes Online Brochure! * External Link Disclaimer: By clicking on these links, you will leave the RDRDigiTAB.com website. RDR and NBC29 WVIR-TV do not endorse and are not responsible for the content of the linked websites. Each link will open in a new window.